PESHAWAR: After getting a ‘security advisory’ from the police of his hometown, Pabbi, over threats from terrorists, Awami National Party general secretary Mian Iftikhar Hussain strongly feels that the proposed strict security checks amount to house arrest. In the advisory issued on Monday (Sept 10), the deputy superintendent of police, Pabbi Circle, asked the ANP leader and former information minister to be extremely vigilant and to sensitise personal guards to terror threats, not to disclose his daily engagements, keep his movement secret, change vehicles and his events’ timings, stop unauthorised persons from entering his house or hujra, install CCTV cameras there, and take other security measures for own security. The police also shared their phone numbers in case of any emergency. “The security measures they (police) have suggested sound as if I am under house arrest and my house is like a jail, where I cannot allow anyone to enter. If they can’t provide me with security and arrest terrorists, it is better the government put me in jail,” Mian Iftikhar said, adding that whenever there was a terror threat, he was asked by the police to remain vigilant. He said all the government offered him was the police personnel. “Right now I have seven police guards. It is hard for me to keep them along as I have neither space (in house or hujra) nor financial resources to care for them,” said the ANP leader, who has a humble background and unlike typical politician has a small hujra in hometown, which is vulnerable to attacks. Mian Iftikhar has long been receiving threats from terrorist outfits and ironically, it is the government, which has been informing and alerting him about them. The terror alerts issued by government are circulated on social media so frequently that many citizens ask the government to go after terrorists, whose details along with pictures are shown in such alerts, instead of issuing advisories to the senior politician. “The banned Tehreek-i-Taliban Pakistan is behind such attacks as I am told,” said Mian Iftikhar. He said the TTP’s different branches were said to be behind such threats. The ANP leader said the recent terror alert was about Tariq group of Darra Adamkhel, whose commander in Afghanistan had trained a suicide bomber, while another bomber, Choto, crossed into Pakistan on Sept 4. He wondered why he was the target of terrorists when he was no more part of the party’s policy-making process and that he was threatened only when he became politically active. 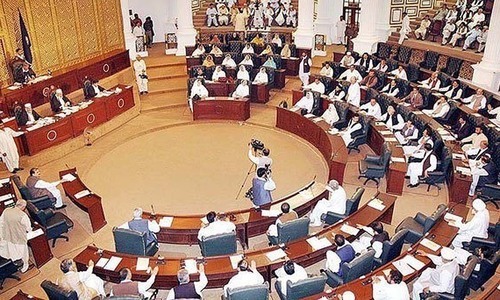 Mian Iftikhar and another ANP leader, Bashir Ahmad Bilour, were the two daring provincial ministers in Khyber Pakhtunkhwa between 2008 and 2013 when the incidence of terrorism peaked in the province. Bashir Bilour was killed in a terrorist attack in Dec 2010, while Mian Iftikhar has long been living an ‘unnatural life’ due to frequent threats to his life from terrorist organisations. “Two men, who had lived in the custody of Pakistani Taliban, have brought a message for me. They told me that the TTP wants to capture me alive and make an example of me. They want to cut me into pieces, they told me,” he said without naming the two for their security. The two were released by the TTP after confining them for one and four years separately. Mr Mian Iftikhar said the state was responsible for his security. “I am a poor man and therefore, he can’t afford to arrange my own security. But I am general secretary of ANP and former information minister. 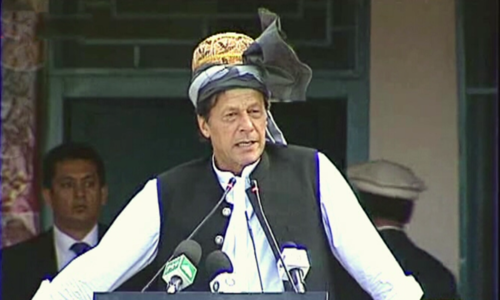 I am not backing out but the government should protect me as it is a fight against terrorism,” he said, adding that it would be the state’s failure if he wasn’t protected from terrorists. “It is all symbolic. If I am silenced, it will mean a great victory for terrorists,” he said. The paper has missed that Mian Iftikhar Hussein's only son was assassinated by the terrorists.